You might think that failing eyesight is the inevitable result of eye strain and age. The truth is that your lifestyle plays a major role in the health of your eyes. A healthy lifestyle can significantly reduce the risk of eye health problems. For example, smoking is just as bad for your eyes as it is the rest of your body. You can reduce eye health problems by quitting right now. Sunglasses are a great fashion accessory, they are also a great way to protect your eyes from the sun’s ultraviolet rays. If you spend a lot of time staring into a computer screen, you probably suffer eye fatigue. As a rule, you should look away from your screen for at least 20 seconds every 20 minutes for eye health. It is also important that you keep a healthy weight. Being overweight increases your risk of developing diabetes, which can lead to eye health problems including loss of vision. There are studies that show your diet plays an important role in eye health. Eating the right foods will help you maintain healthy eyes. 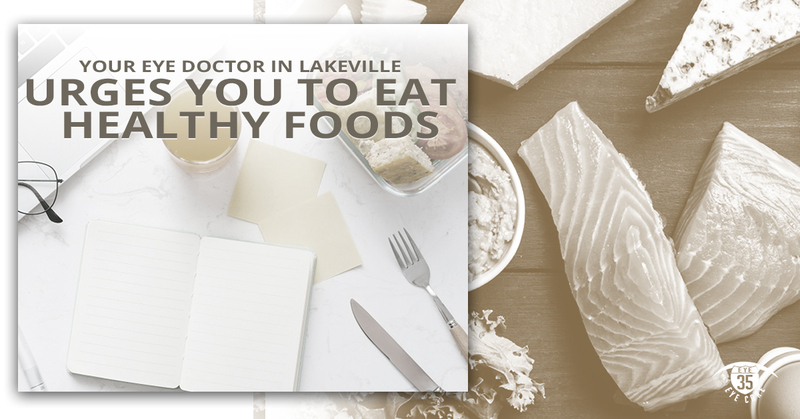 Eye 35 Eye Care, your eye doctor in Lakeville, offers the top foods for healthy eyes. Many types of fish are rich in omega-3 fatty acids, which is essential for good eye health. The types of fish that contain the most beneficial omega-3s include salmon, tuna, trout, sardines, mackerel, anchovies and herring. There are studies that found fish oil can reverse dry eye and can protect against cataracts and macular degeneration. If you aren’t a fish eater, it’s a good idea to take omega-3 supplements. Leafy green vegetables are full of zeaxanthin and lutein, both of which are critical for good eye health. The leafy greens you should be eating for eye health include kale, collards and spinach. Avocados, peas and broccoli are also good sources of this powerful antioxidant. Eggs are also an excellent source of lutein and zeaxanthin. Eggs are also a good source of zinc and vitamins C and E, also needed for good eye health. Two important antioxidants that help to keep your eyes healthy are vitamins C and E. Vitamin E helps protect your eyes from the free radicals that disrupt healthy tissue. Vitamin C can actually lower your risk of developing cataracts and it may even slow the progression of macular degeneration. You can get these eye-healthy vitamins in citrus fruits including oranges and grapefruit and you can get them by eating sweet potatoes. You knew this would come up. You never see rabbits wearing eyeglasses because they eat plenty of carrots for good eye health. Carrots are a great source of vitamin A, which is important for good eye health. Vitamin A deficiency leaves around 500,000 children worldwide blind each year. Oysters are a wonderful source of zinc. Why is zinc important for good eye health? Zinc is essential in many of our body’s processes. For example, zinc is needed to get vitamin A from our livers to our retinas. It doesn’t matter how much food you eat loaded with vitamin A, it won’t get to where it needs to go without zinc. Bell peppers give the most vitamin C per calorie. Vitamin C is good for the blood vessels in your eyes. Studies show that vitamin C could reduce your risk of getting cataracts. Studies show that vitamin E, along with other nutrients, can help slow age-related macular degeneration and may also help prevent cataracts. An ounce of seeds or almonds has half the daily recommended amount of vitamin E. Peanut butter is also an excellent source of vitamin E.
Lean meat and poultry are both great sources of zinc, which as we mentioned before, brings vitamin A from your liver to your retina where it is used to make the protective pigment melanin. So if you don’t like shellfish or oysters, eat chicken and beef instead. Swap out carbs for brown rice, quinoa and whole wheat bread with zinc, vitamin E and niacin to help promote good eye health. It is also important that you have your eyes examined on a regular basis for good eye health. Call Eye 35 Eye Care today and schedule an appointment.